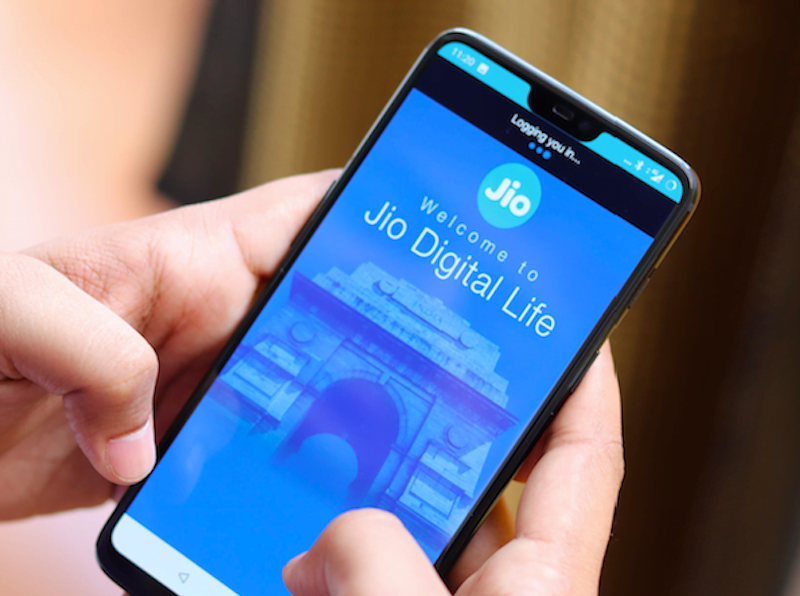 Reliance Jio is continuing its pole position in the monthly subscriber addition list as the telco managed to grab 11.7 million new users during July 2018. According to the monthly subscription data released by the Telecom Regulatory Authority of India (Trai), Mukesh Ambani-owned firm, Reliance Jio Infocomm has extended its subscriber base by another 11.7 million, which takes the overall user base to a 227 million as of July 2018. At the company’s Annual General Meeting in July 2018, Ambani announced that Jio has 215 million users as of June 30, 2018. And the user base keeps on growing with every passing month. Compared to Vodafone which is second on the list, Jio has added close to 20 times more subscribers in July. First and foremost, Reliance Jio is the fastest telecom operator to surpass 100 million user base in 172 days. Later on, the subscriber growth reduced, but that didn’t take away the fastest growing telecom operator in the globe crown from Jio. At the end of July 2018, Jio’s overall subscriber base has reached an all-time high of 227 million and is currently standing third on the list of subscriber base. In July 2018, Reliance Jio has added 20 times more subscribers than Vodafone, which added just 609,074 new subscribers during the same period. Vodafone India and Idea Cellular are now jointly called Vodafone Idea Limited and their subscriber base is merged too. As of August 31, 2018, the merged entity has 408 million subscribers. During the month of July, Idea Cellular has added a mere 5,469 subscribers, and Vodafone added a total of 609,074 million users. Overall, Vodafone Idea Limited’ subscriber base is increased by 614,543. India’ second largest telecom operator, Bharti Airtel has added 313,263 new subscribers during the same month, which is way smaller number than what Airtel is capable of. Bharat Sanchar Nigam Limited or BSNL, which is currently the fourth largest telecom service provider in India has added 225,962 new users in July. 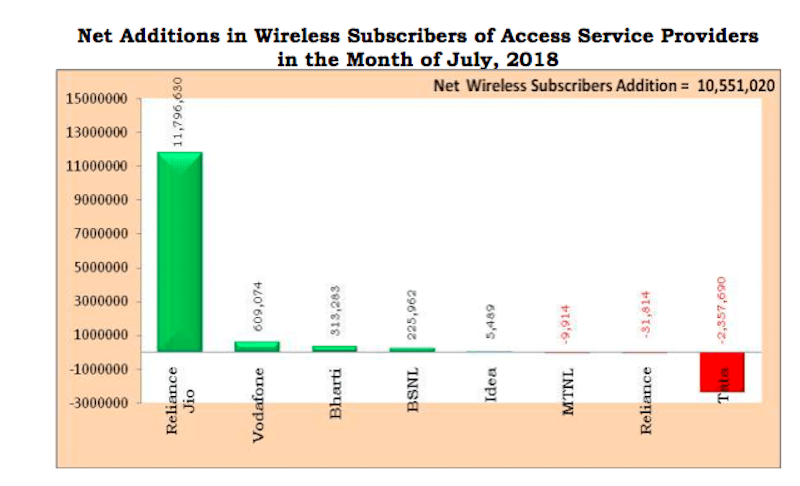 BSNL’ number is smaller than Vodafone and Airtel, but the telco has retained its positive monthly subscriber addition. Another state-run telco, MTNL has lost 9914 subscribers during the same period, which is underwhelming. BSNL is expecting the monthly subscriber addition number to grow once it launches 4G services to the public as it has one of the best-prepaid tariff plans in the industry. Tata Teleservices, which announced its merger with Bharti Airtel is still losing subscribers on a massive note. In July 2018, Tata Teleservices lost 2.3 million subscribers, while Reliance Communications (RCom) has lost 31,814 subscribers, continuing its losing spree. Airtel is currently in the process of securing necessary approvals for its merger with Tata Teleservices, which will boost the subscriber base of the company. Overall, the number of telephone subscribers in India increased from 1,168.89 million at the end of June 2018 to 1,179.32 million at the end of July 2018, showing a growth of 0.89%. How BSNL getting positive growth?? Who are taking their Sims?? When they will give 4G services??? Reports are false and operator show high user base for claiming more Airwave’s. Here I just inform you 2 reports. 1. In kolkata Jio user base continue increase around 2lac per month. This is 100% false. 2. In WB circle , vodafone also increase it’s user base approximately 3 lac per month…. Also this is false.